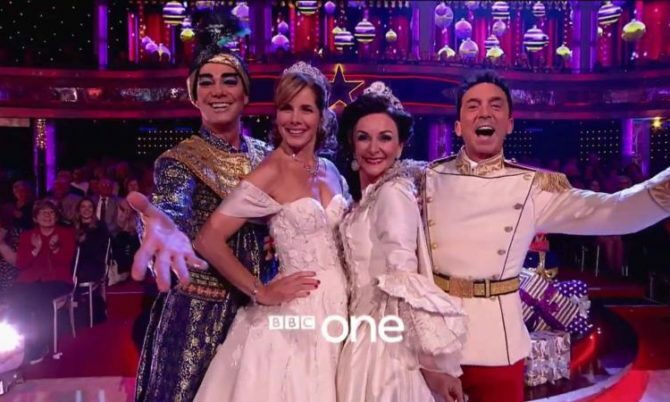 Darcey Bussell looked spectacular on the Christmas Special of Strictly Come Dancing wearing a stunning bespoke blush gown handcrafted from silk organza perfect for the festive extravaganza with a fairytale theme. Darcey Bussell looked fabulous on last nights Strictly Come Dancing wearing a stunning black bespoke Caroline Castigliano gown handcrafted from fluid crepe. Last night Darcey Bussell wore a stunning bespoke Caroline Castigliano gown on Strictly Come Dancing. The gown was handcrafted in the finest silk crepe with a Chantilly lace bodice hand appliqued with blue stones and embroidered with silver thread.